It took me a while to write this blog post as it is a personal account of a part of my life that is quite personal. People that know me will know that this is not normally something that I will do, but I do think that the time is now ripe to do so. 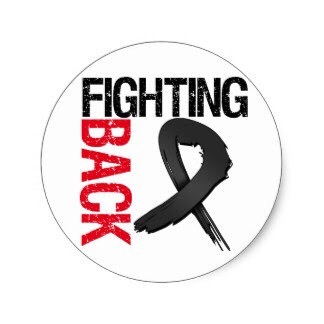 I was diagnosed with stage 4 metastatic melanoma during 2016 (lower case letters are deliberate) and was very lucky to come through on the other side relatively unscathed. 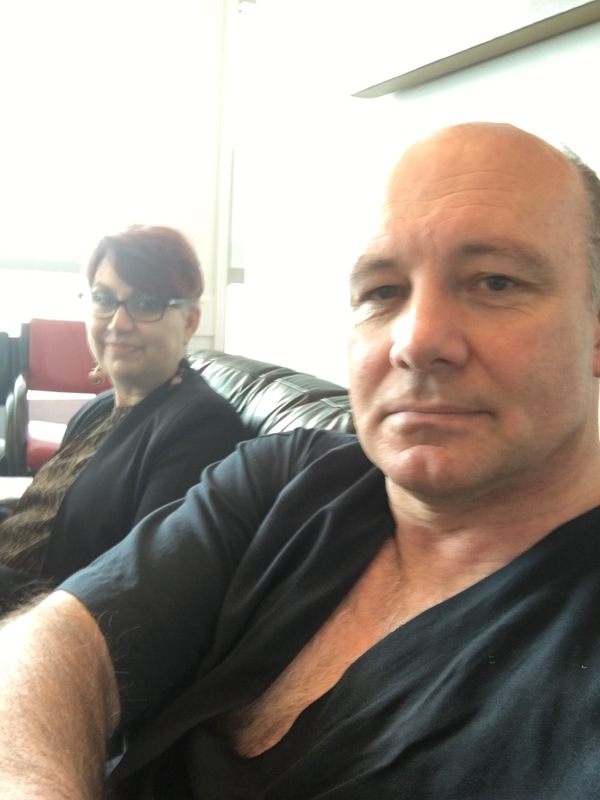 This blog post is not about cancer and how to fight it, it is more an account of my interaction with Bonsai trees during the healing time. Much is said and is written about meditation and its positive effects on the body and mind. There are also writings and accounts of the meditative encounters that people have while interacting with nature. 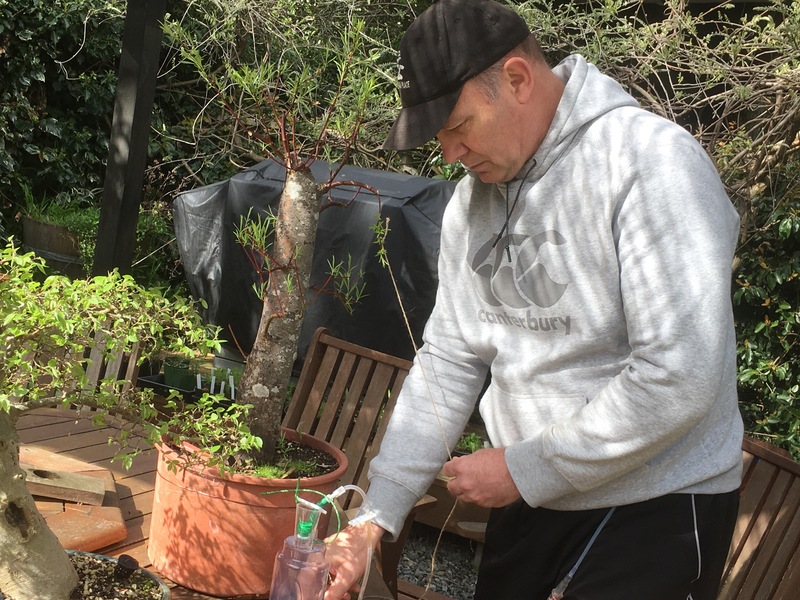 Although I do not specifically work on Bonsai trees for the sake of a meditative experience, I do believe that while working on a tree, and when totally focussed on the task at hand, it is very easy to find yourself “in the zone”. Whether this is a form of meditation, I am not sure, but it sure feels like it. Whether I am working on a smaller or a large tree, the effect is the same. I am more relaxed during and after the experience. In my mind this is due to the fact that I engage in a state of mindfulness. This is necessary as I need to respect the tree and am not in a position to make mistakes. Creative pursuits tend to ask for total mindfulness and a state of relaxed alertness to do justice to what nature has given you to work on. Without this mindfulness and focussed state, mistakes will be made and if in a hurry, wrong design decisions will be made. In Bonsai, these will take years to be corrected and can even lead to the death of a tree. Wound drain bottle was carried around. Just making sure that the scissors and plastic tube did not meet. During my healing after surgery and especially during the radiation phase, I regularly interacted with my trees, and as it was during Spring and Early Summer, there was a lot to do. I did miss the repotting opportunity during that time as I did not think it was wise to work too much with soil-filled bacteria and other creepy crawlies around. Most of the work was around pruning trees, styling, inclusive of wiring and also removing wire. These are repetitive actions and on a large tree can take up to three hours. Due to the radiation effects, I had to break lengthy jobs up into shorter stints to not over burden myself. Smaller trees I could move myself, but my wife had to help with the larger ones. I had a wound drain hanging out of my side and this could become tricky with the plastic drain tube and very sharp pruning scissors snipping away. For me, the time that I spent working on the trees, sometimes just studying the trees for future jobs and appreciating the beauty and form of trees, did impact positively on the healing process. It led to me being calmer, taking my thoughts away from the current situation and afterwards feeling satisfied with a job well done. It also forced me to be outside in fresh air. This led to a positive frame of mind which definitely helped to get me on my feet and looking forward to what the future holds. On top of my interaction with Bonsai trees, the support of my wife, Susanna, was immense to help me through some pretty dark times and I will forever be in her debt for her support. So there you go, if something is wrong, work on your trees and make sure that you have great support around you, and you to will be up and running in no time. Radiation time with Susanna in support. I wonder if the radiation had an effect on the trees? I have decided to plant some trees in the ground over the next few years to aid their development. Here is the start of the project captured on video. The title of this Blog could just be me trying to get as many search terms in the title as possible as the water movement is the same through all plants, large and small. Crafty Blogging! The only difference could be that some plants do adapt to either get rid of excess water and others adapt to try and hold on to as much water as possible. Examples of these in the Bonsai world could be conifers that have needles and scaly leaves instead of large, flat leaves. This is in part to stop water loss, but also for snow to easily glide of the leaves and branches in nature. The smaller surface area means less stomata through which water can be lost. Stomata on a leaf surface. Water escapes through here and gasses also move through here. These are open. Smaller surface area for transpiration. Larger surface area for transpiration. stomata. These little structures have a dual function. Not only is it there for water to escape from the plant, a process called transpiration, but they are also in place for respiration to take place. That is the exchange of gasses in (Carbon dioxide) and out (Oxygen) of plants. Both of these processes are crucial for the survival of plants. For water to move through a plant, there are two main processes taking place. The one has already been mentioned. This is transpiration and it is a pulling force. As water is lost through the leaves, more water is pulled up through the fibres (Xylem). The other process is root pressure. This is a process through which water enters the epidermal cells of the roots, move through the cells and into the endodermis layer. These layers of cells work like a “water pump”. From here the water is pushed into the Xylem. This action takes place against the force of gravity. It is helped by a process called capillarity. This is where water rises up a thin tube due to the adhesion and cohesion forces between water particles. This process can be seen when you place a thin straw in a glass of water. The water level inside the straw will be higher than that of the water in the glass. It is important to know about these processes when applied to Bonsai. We do a few things to Bonsai that can interrupt these processes and disturb the flow of water through a plant. Also remember that the water also contains minerals and nutrients for the plant. Nutrition will also be interrupted if these processes cannot take place normally. A bag around a twig catches water lost through transpiration. necessarily a problem if the whole branch is removed, but it can restrict water flow to parts further up the water channel. The third thing we do is to leaf prune or defoliate. See an earlier Blog on Defoliation. This obviously interferes greatly with the process of transpirational pull. It weakens the plant and should only be done with healthy plants. These are things (pruning) that must be done if you want to cultivate healthy, good looking Bonsai. I make the call here to think before we do. Questions that must be asked is whether the tree is healthy, is it the right season, am I doing it for the right reasons, what am I trying to achieve and is it the right thing to do for the specific species? If you can answer these questions positively, then go ahead and cut. To maximise success however, ensure that the tree is placed in the shade afterwards and that watering is increased. Just be careful with the watering when you have partially or fully defoliated the tree. It means that there are fewer leaves to get rid of the excess water. Misting is always an option as well. Let’s bring Science and Creativity together to create even better Bonsai with a great chance of survival. The concert hall at the Sydney Opera House holds 2,700 people. This blog was viewed about 9,700 times in 2015. If it were a concert at Sydney Opera House, it would take about 4 sold-out performances for that many people to see it. 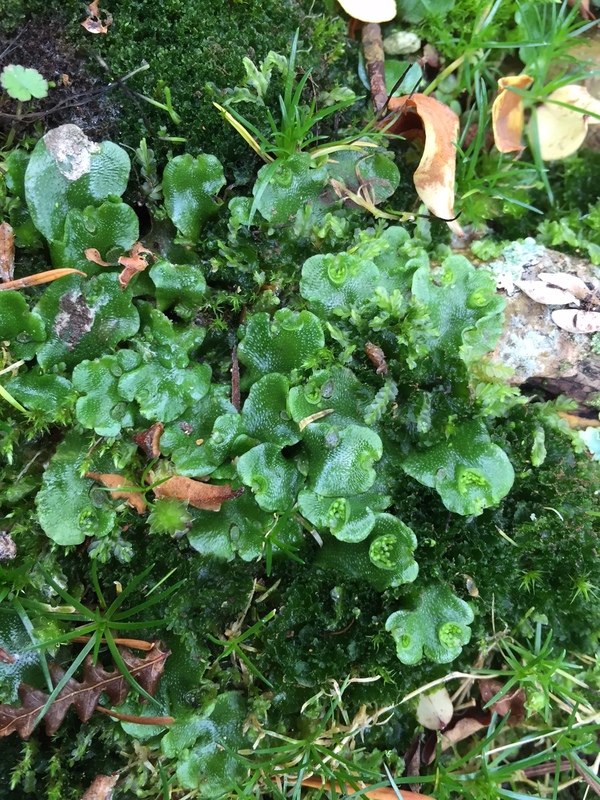 Liverworts are flat growing green plants, closely related to mosses (Bryophytes). They have no stem and only a thallus, the flat leaf-like structure that is seen above ground. They belong to group called Hepatics and belong to the Marchantiophyta, a division of bryophyte plants, the mosses. These plants are primitive, not only in structure, but also in the fact that they are old. Some sources mention that they transition onto land during the Devonian Era (400 million years ago). Goes well with Bonsai then, I hear you say. Not really. Bonsai growers will find these plants in moist areas. Where I live we have a high rainfall in winter and I have to be very careful with watering. This is usually taken care of by ensuring that the soil medium is free draining. Most of the liverworts that I see growing on soil come from nursery sourced plants, probably because the soil contains the spores and the fact there could be lot more organic soil in nursery plant soils. The problem for me is that they can rapidly cover the surface of the soil and prevent water from penetrating the soil. This is not necessarily a problem as they already indicate that the soil is too wet. 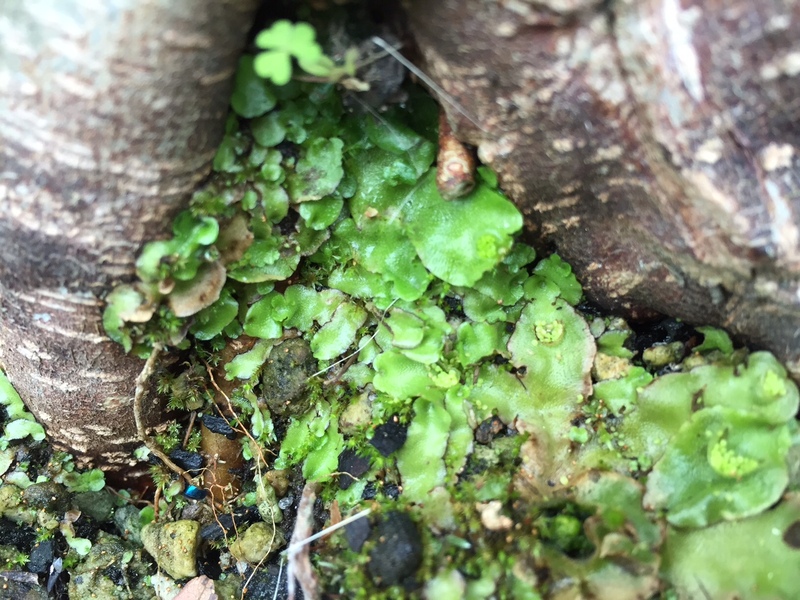 This layer of Liverwort can also prevent proper air circulation through the soil. I have also had experience of Liverwort growing over moss (I want the moss), suffocating the moss to death. These plants reproduce asexually and sexually. They produce bumps (cupules) on the leaves, usually during late autumn, containing “eggs” called gemmae. These produce new plants. The sexual reproduction produces spores which germinate and form new plants. As said, these plants can be an indicator that your soil or growing medium is too wet. If this is the case, it is obvious that the medium must be changed to be more free draining. Larger inorganic particles can be used to do this. If it is still a problem, look at the top layer of the soil. This could contain spores of liverwort. Scrape the top layer off and replace with a coarse material like gravel or pea metal. 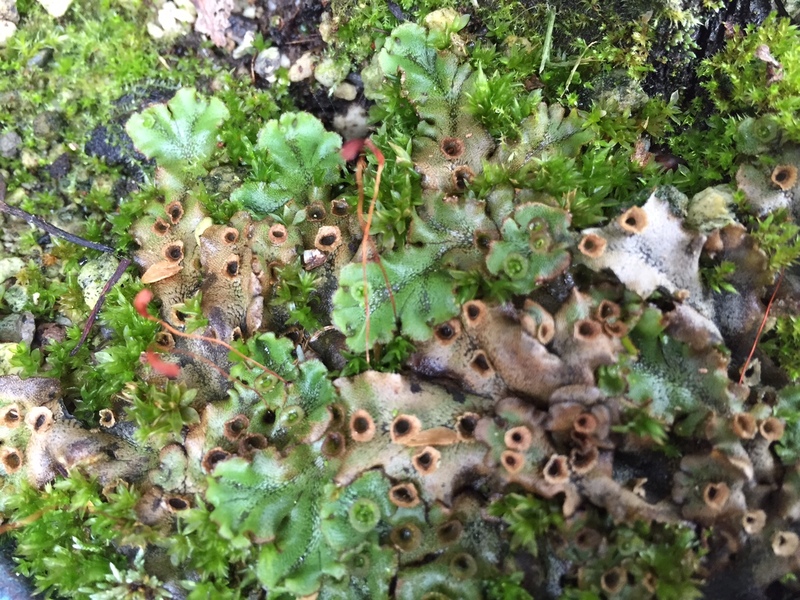 Harsh chemicals could be used to spray on the liverwort to kill them off, but I have found that dabbing or brushing vinegar on the leaves of the liverwort, kills them off as well.